For thirty dramatic years, England ruled a great swath of France at the point of the sword—an all-but-forgotten episode in the Hundred Years’ War that Juliet Barker brings to vivid life in Conquest. Following Agincourt, Henry V’s second invasion of France in 1417 launched a campaign that would place the crown of France on an English head. Buoyed by conquest, the English army seemed invincible. By the time of Henry’s premature death in 1422, nearly all of northern France lay in his hands and the Valois heir to the throne had been disinherited. Only the appearance of a visionary peasant girl who claimed divine guidance, Joan of Arc, was able to halt the English advance, but not for long. Just six months after her death, Henry’s young son was crowned in Paris as the first—and last—English king of France. Henry VI’s kingdom endured for twenty years, but when he came of age he was not the leader his father had been. The dauphin whom Joan had crowned Charles VII would finally drive the English out of France. 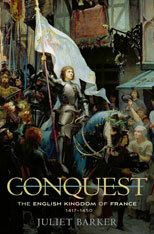 Barker recounts these stirring events—the epic battles and sieges, plots and betrayals—through a kaleidoscope of characters from John Talbot, the “English Achilles,” and John, duke of Bedford, regent of France, to brutal mercenaries, opportunistic freebooters, resourceful spies, and lovers torn apart by the conflict.